Editor’s Note: Sandi Teplitz, our regular food correspondent, interviewed Kevin Danna, member of Congregation Sons of Israel and proprietor of Binah Winery. Sandi: Tell me a little about your background, Kevin. Kevin: I am native to a region of Southern California with a Mediterranean-like climate. Growing up, I viewed vestiges of old wineries and vineyards that once sprawled across the area; deep down, I had a feeling that this was in my future. The wine ... it was my soul. K: My paternal great-grandfathers were from Sicily and made their own wines. S: What was your initial experience at winemaking? K: The first vintage I ever produced used my great-grandparents' old fruit press. It was clunky, clumsy and difficult to use, but it made wine, and thus the experience was quite satisfying. K: My first vintage was spring of 2014 with about 325 pounds of Chilean grapes that I picked up from Keystone Homebrew in Bethlehem. S: Why here in the Lehigh Valley? K: We started using local grapes in 2015, which provided us with fresher grapes and avoided issues with shipping the grapes from thousands of miles away. Often the grapes were picked and started fermenting on the same day. This is ideal! S: Is winemaking an arduous task? K: That first crush, we probably had a dozen friends over in my basement, de-stemming 325 pounds of grapes by hand. It was labor intensive! Since then, I have devised time-saving, quality-improving techniques. My parallel commercial winemaking experience at Pinnacle Ridge Winery in Kutztown has also helped. S: What is your level of experience? K: I have worked on more than 100 different wines in the past five years. I have advanced to become Pinnacle Ridge's assistant winemaker (official title) and have been in charge of all the day-to-day winemaking and cellar operations for the last few years. S: What is the status of your current wine production? 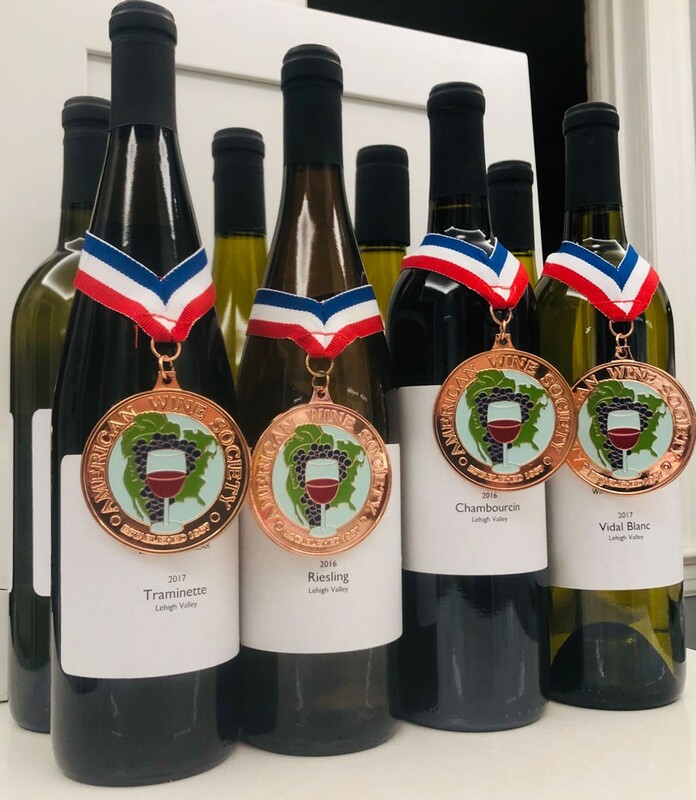 K: I have had eight wines that were awarded medals in the American Wine Society's national competition, as well as the Cellarmaster's competition in Los Angeles. We will be making the jump to commercial in 2019 with the startup of Binah Winery, which will be Pennsylvania’s premier kosher winery. Our plan is to produce 500 cases in 2019. Once we hit 2,000 cases annually, we will bring in people who can take over the daily responsibilities of running the winery. Our intent is ultimately to attain boutique status, producing 10,000 cases per year. S: I've tasted your Blanc de Noirs, which was spectacular; you are quite the entrepreneur! When can we look forward to purchasing your wine? K: Right now, we need to focus on getting Binah off the ground. We are searching for a global production space and taking pre-orders to get our first vintage underway. Our winemaking has always really been about the local community, a sense of collective belonging. We would not have achieved success to date without the generous help of family and friends. This winery belongs to Allentown, Bethlehem and Easton ... the entire community. @binahwinery on social media (Instagram, Facebook, and Twitter), or write kevin@binahwinery.com.